4 Can Age Spots Be Reversed? Pen Pals don't have to be a thing of the past even with the invention of email and online networking. You can find pen pals who share your interests and also love to write. Many people still enjoy making friends with pen-pals and receiving old-fashioned, hand-written letters in the mail. 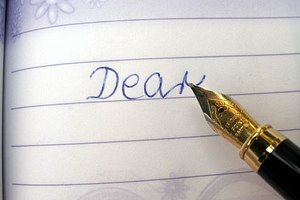 Here's how to find Pen Pals. Find pen pals through the classified section of small newsletters and interest-specific magazines. If you are a homeschooled teen, look for pen pals through a homeschooling newsletter or e-list. Find a pen pal through your club or organization. For example, if you belong to a 4-H club, network with other clubs to find a pen pal. Try writing to your extended family members and cousins you only see infrequently. You may be surprised to find the perfect pen pal in your own family. Ask at a local nursing home for the name and address of an elderly resident who would like to receive and send correspondence. You may find a pen pal and make someone's day brighter at the same time. Be very careful about looking for a penpal online. Never give out personal information in a public forum or to someone you do not know.